By entering the Competition, each Entrant (as defined below, and where applicable the Entrant’s parent or legal guardian) unconditionally accepts and agrees to comply with these terms and conditions (“Rules”), and agrees to be bound by the decisions of the Promoter (Zuru) in respect of the interpretation of these Rules and otherwise in relation to the Competition. Entrants who do not comply with the Rules will not be eligible to win the Prize (as defined below). Please read the Rules carefully. The Competition is open to individuals who who are aged between four (4) and fourteen (14) years inclusive (the “Entrants” or individually, the “Entrant”). All entrants must obtain their parent or legal guardian’s permission prior to entering the Competition. The Promoter may require you to provide proof that you are eligible to enter the Competition. The Competition opens on 27 July 2016 and closes on 8 September 2016 (Closing Date). Entries received after the Closing Date will not be accepted. Only one (1) Entry per person is permitted. Early, late or incomplete Entries will be disqualified. Entrants accept the use of their information in accordance with Rules. For more information see below under Use of Personal Information. The Competition is not open to employees or contractors of the Promoter including each of their affiliates, subsidiaries, divisions, or any person directly or indirectly involved in the organisation or running of the Competition or their direct family members. There will only be 1 winner. The winner will be selected by a representative of the Promoter from the pool of Entries who made a creative submission. The winner will be informed within the 7 days after the Closing Date. 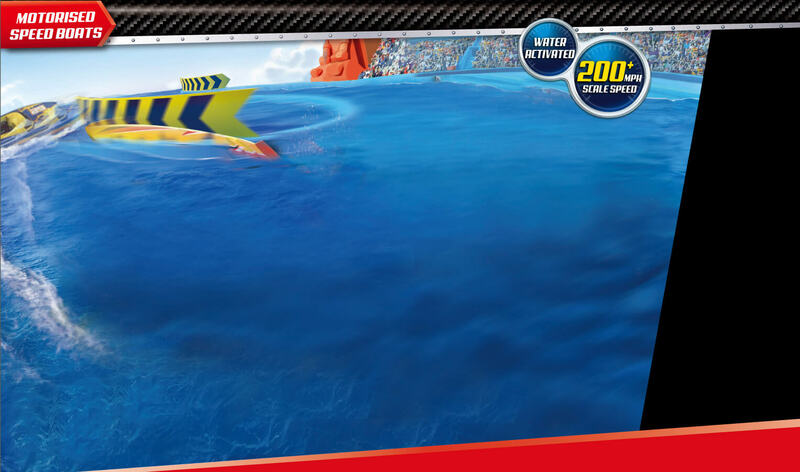 The winner will be awarded a Shark Attack Track playset, and four different Micro Boat individual pack models (different colors each). The Promoter’s decision concerning the determination of the Competition Winner and all matters relating to the Competition will be final and binding. The Promoter takes reasonable care to ensure that the Prizes are as described in these Rules. However, events may occur that make the awarding of the Prize impractical or inappropriate due to unforeseen circumstances or reasons beyond the control of the Promoter. In this situation, the Promoter may vary or amend the Prize to provide a reasonable alternative as a result of which the Promoter or parties connected to the Promoter shall not be held liable. No cash or credit alternative is available and the Prize is not transferable or negotiable. If a Competition Winner does not confirm acceptance of the Prize within 14 days of being informed of winning, he/she will automatically forgo their right to claim the Prize and another Competition Winner will be selected in the same way. If Competition Winner or their parent/legal guardian also fails to accept the Prize in the required manner, another Winner will be selected and so on until a Competition Winner is chosen and accepts the Prize in accordance with these Rules. Visiting www.zurumicroboats.com , navigating to the “WIN” section of the site, e and completing and submitting the competition entry before the Closing Date. Completing the competition entry includes entering a creative submission as text into the box provided, and clicking on the submission button. An adult or supervisor may assist in completing the competition entry, but the creative submission must be devised by the Entrant personally. Ineligible or fraudulent Entries are void. The Promoter is not responsible for lost, late, or misdirected Entries, for technical, hardware or software failures of any kind, for lost or unavailable network connections, or for failed, incomplete, garbled or delayed computer transmissions or any human error which may occur in the receipt or processing of the Entries. Use of computer programs and other automatic means to enter the Competition is prohibited and may result in the disqualification of the Entrant. In the event of a dispute regarding the identity of the person submitting an Entry, the Entry will be deemed to be submitted by the person in whose name the e-mail account is registered on the date the Entry is submitted. All Entries become property of the Promoter and will not be returned. Any further dispute, including non-contractual, arising from this Competition shall be governed in accordance and exclusively with English law. The information that you have submitted may be collected by the SuperAwesome Club and/or ZURU. The information submitted by the Winner/s may also be used by the ZURU for post publicity events and any other publicity purpose without any remuneration. The Competition is organised and administered by ZURU.